If you want to run a successful business, you need to take care of establishing and managing customer relationships. It doesn’t matter if you are a business owner or a marketing specialist, it’s important to be aware of the most common ways and methods of growing a community of loyal customers. Part of encouraging community growth is knowing the journey that your clients take across your website and other digital properties. Every potential buyer can be at a different place while dealing with your brand. The biggest goal of every digital marketing specialist is to turn one-time buyers into the returning loyal customers. Understanding lifecycle stages can help you maximize the overall buying experience. To get a better understanding of the real browsing intentions of your customers and boost your business revenue, let’s dig deeper into the meaning of customer lifecycle marketing, as well as the goals and challenges involved. Customer lifecycle marketing is the term that defines all strategies that businesses use to attract clients, convert, retain, and leverage with the purpose to boost revenue and grow their brands. All such strategies engage customers throughout their buying journey. 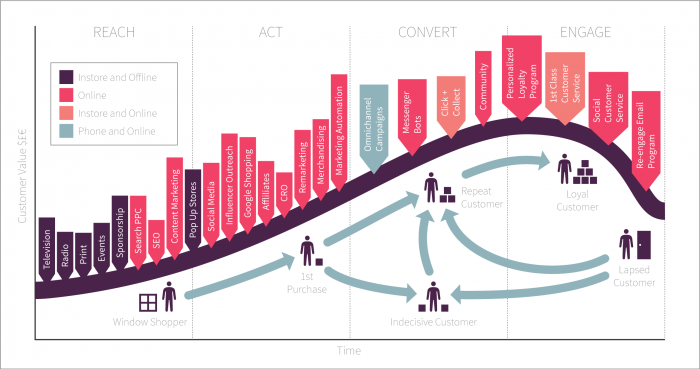 When talking about customer lifecycle marketing, we need to take into consideration the main stages that take a buyer from the first acquaintance with your product or service through purchase, loyalty, and retention. The following picture serves as a useful visualization of the customer journey throughout all stages that are included in a typical lifecycle. Since we’ve mentioned customer lifecycle stages that are included in the marketing funnel, let’s discuss them in more details. This is when a customer begins the relationship with your brand. The awareness stage includes the acquaintance of a customer with your brand, as well as the products or services that you provide. In fact, a client typically becomes familiar with a company long before he or she reaches its website. Thanks to active promotion of your brand through social media channels and word of mouth, people get a general understanding of the things that you have on offer. As soon as a customer orders something from you and enjoys the quality of the item/service that you provided, it’s likely they will be looking for more channels to connect with you and follow your updates. For example, people can engage with your brand through the popular social media channels, newsletter subscription, blog, etc. Once they access more information about your company, people are likely to start paying more attention to the feedback that fellow customers shared about their cooperation with your brand. Companies that run an active social media presence have more advantages at this stage. They are more open to the community, which suggests that they are having a more open dialog with customers. Every customer passes through this stage. We all look through customer reviews before making purchasing decisions. Also, we compare similar offers from different brands in order to choose one with the best quality and cost. One of the best ways to stand out from your competition is providing robust digital self-service. Letting your buyers analyze and evaluate your offers, you give them a chance to find the answers themselves, thus providing them with consistent information through multiple channels. This is the moment when a customer makes the final decision to buy your product. Providing maximum support at this stage is essential. Research shows that more than 80% of customers require some degree of support while making a purchase. More than 50% of buyers will abandon the purchase if they cannot find quick answers to their questions. One way to solve for this need is live chat services. The real-time, contextual response can give your customers the assistance they need to have a great experience, while minimizing the lift on your team. There is no doubt that attracting new customers is more difficult than keeping existing ones. Apart from delivering high-quality products and services, it’s important to offer exceptional support. Every interaction with customer support reps should convince the buyer that you are interested in building a relationship with her, not just making her place an order. According to statistics, more than 70% of customers choose to remain loyal to brands based on the quality of customer service. Finally, a buyer is now a customer. The last, ongoing step that you need to take is establishing a long-lasting connection with them. Create an emotional bond as you continue to provide quality services and support. Show that you value your connection and ensure that the customer feels the same. Develop customer lifetime value marketing strategies to make your customers loyal advocates of your brand. Nurture prospects into making their first purchase on your site. Turn one-time buyers into repeat purchasers. Convert returning customers into your loyal, long-term buyers. Provide quality support to new and repeat customers. Reactivate “at risk” customers (buyers that have passed the time when they were expected to complete an order) before they lapse. Reactivate lapsed customers into active buyers. Engage with the customer base and keep tabs on whether they are seeing value. How does CLM increase marketing profit? According to data collected by Gartner, about 80% of a company’s future profits come from 20% of its existing customers. Customer retention is mission critical for successful growth. Marketing strategies that improve loyalty through customer lifecycle engagement increase the odds that people will make repeat purchases. Keep track of the percentage of clients that return to make more purchases on your site. Such information will help measure customer loyalty. To determine the share of repeat buyers, compare new clients versus returning ones. When a person reaches your site for the first time, try to collect contact details by offering the option to subscribe to your email updates. This can help you grow share of mind and encourage customers to make their first purchase on your site. Measure how much return customers spend on repeat purchases. If you see a trend toward smaller purchases, experiment with loyalty offers that can help increase spend. Share email newsletters even after customers make a purchase. This will help buyers remember your brand and keep it top of mind for future purchases. Make every customer feel special. The VIP touch makes customers feel like they’re part of your brand. This can be revealed through exclusive offers and memberships. When a customer feels that a brand values him/her, it’s more likely they’ll return again and again. Customer lifecycle approaches vary in different industries. I’ve highlighted general customer retention tips. However, every brand is special, featuring its unique approaches that work with the target users exclusively. Whichever strategies you select, the thing that we can state with 100% confidence is that you need to communicate with your audience and provide when with the proper assistance. Create a better journey for your customers and they will pay you back with a revenue boost. Does Your Website Design Cause Click Uncertainty?